Madam Cutie on Duty episode 20 recap – finale! Side dish: I don’t understand how Lin Heung and the women induced vomiting and diarrhea with crab and raw soy milk. There is a recipe for Soy-Milk Custard and Crab, and it looks delicious, not invasive. Undercover cops, Apple (Priscilla Wong) and Tai Shu (Edwin Siu) are left standing on the curb as their estate neighbours, Dan Dan (Mandy Wong), Fung Nei (Kaki Leung), and Lin Heung (Rachel Kan) are kidnapped by loan sharks, and their husbands and son give chase in a taxi. Dan Dan’s husband keeps Tai Shu in the loop via cellphone, informing him when they arrive at a junk yard. Unfortunately, by the time the cops arrive on the scene, the civilians are no where to be found. The men have been captured by the loan sharks, and if the loan sharks do not get their money back, everyone dies. The women convince the loan sharks to message Apple and Tai Shu with a demand for $3,000,000 in exchange for the hostages. The police decide to entrap the loan sharks, and stop Ching before she escapes with the $3,000,000 back to the mainland. Responding to an alarming phone call from the hospital about her comatose brother, Ching arrives only to find police boss, Wu Sir waiting. Though he gets handcuffed to the hospital bed by Ching, Wu Sir manages to convince her to cooperate with the police lest she become an accessory to murder if the loan sharks kill their hostages. Ching contacts the loan sharks and makes a deal, claiming to need help getting past the police patrol to escape Hong Kong. 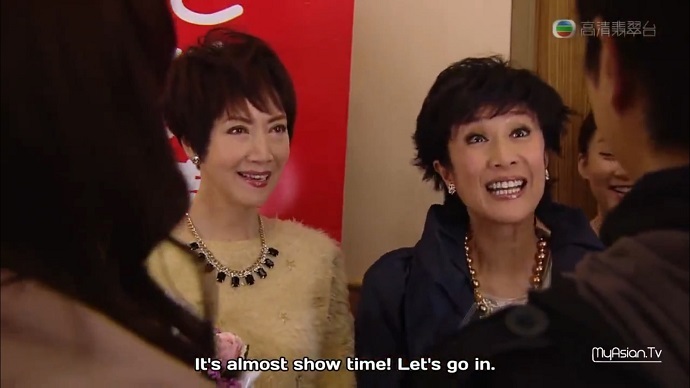 The loan sharks arrange to meet up with Ching, but quickly realize that it is a police setup, and manage to get away. Meanwhile, the thugs left to guard the civilians start getting hungry. The women convince them to let them cook, and Lin Heung creates a menu of crabs and raw soybean milk that induces vomiting and diarrhea. When the thugs catch the men trying to cut through their zip ties, the women attack with condiments, cooking tools and bug zappers. They are just about to escape when the loan shark boss arrives with a gun, which trumps any squeeze bottle. The loan shark’s men are clearly suffering from food poisoning, and the boss decides to kill Lin Heung’s teenager son as punishment. Fortunately, Apple managed to decipher a hidden clue within the women’s text message. She, Tai Shu, and fellow undercover cop, Ga Lun arrive on the scene just in time. Tai Shu finds a football then kicks it to his estate teammates until the ball ricochets into the loan shark’s face. Apple and Ga Lun jump in to join the action, and when the loan shark attempts to shoot Tai Shu, Apple pushes him aside just in time, and takes a bullet to the face. Tai Shu manages to train a gun on the boss, and end the standoff. When Tai Shu visits Apple in the hospital after plastic surgery to her face, he lies about former suitor, Valentino being too busy to come. Apple quickly finds out that Valentino is already romancing another colleague. Tai Shu tries to cheer her up then somberly reports that their estate apartment will be cleared shortly, now that the undercover operation is over. Apple asks Tai Shu to take care of her plant until she is released from the hospital. Tai Shu assumes that she treasures the plant, because it is a gift from Valentino. Tai Shu has a reunion with his grateful estate neighbours then returns to the apartment that he shared with Apple to pack up. He comes across Apple’s mementos box, and reads the love letter that she wrote to him back in high school. Tai Shu puts it all together, and finally realizes who Apple is. After being informed by Apple of his mother’s imminent departure, Tai Shu arrives in time to catch her. He refuses the durian cake she bought for him, but only because he wants the homemade one she had promised. Tai Shu and his mother have a touching reconciliation, then later, share some smelly, homemade durian cake. When Tai Shu’s father notices Apple’s plant, he identifies it as an apple sapling. Tai Shu realizes that the plant is associated with him, and not Valentino. Tai Shu receives a frantic call from Apple’s mother, because her daughter has left the hospital. Apple is in their apartment staring at their fake wedding portrait while clutching the bandage on her face. A montage of Tai Shu and Apple’s moments together plays out. Dan Dan comes into the apartment, and thanks Apple for saving her and her husband. She finally returns the dress she ripped then stole from Apple’s suitcase when they first met, having mended it. She uses the repaired dress as a metaphor for Apple’s face. Tai Shu arrives and Dan Dan departs to give them their privacy. Apple gets choked up, because there is no longer any reason for her and Tai Shu to be together. Tai Shu insists that the plant she left in his care has grown six feet tall, and produced apples. 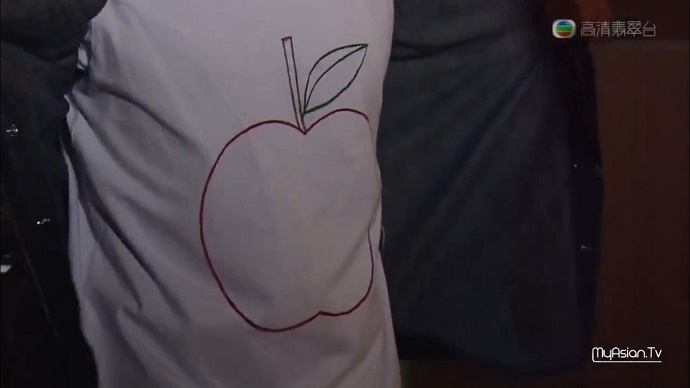 He opens his jacket to reveal an apple drawn on his t-shirt. He starts doing the same rap about apples that he performed for her years ago, and Apple joins in. Tai Shu reminds her of his promise to stomach her if no one else will have her. It’s happy endings all around. Apple’s face completely heals. She now jogs with Tai Shu, and teases him with Korean terms like ‘ahjusshi’, ‘fighting’ and ‘oppa’. Dan Dan’s daughter has been admitted into the highly rated primary school that her parents had hoped for, and Dan Dan has joined the Auxiliary Police Service to fight loan sharks. Apple’s mother convinces Lin Heung’s mother-in-law to partner with her in a Chinese opera duet, and gives her a glamorous makeover. Fung Nei’s husband’s logistics company will open next month. which means he can now live full-time in Hong Kong with his family. He and Fung Nei are ready to work on producing the grandchild that Fung Nei’s mother-in-law wishes for. Ga Lun is no longer gassy since becoming a godson to Fung Nei’s mother-in-law, thanks to her homemade soups. Tai Shu meets the approval of Apple’s mother, since revealing his true profession and putting on a decent suit. It is a good thing, because Apple and Tai Shu become a married crime fighting couple. 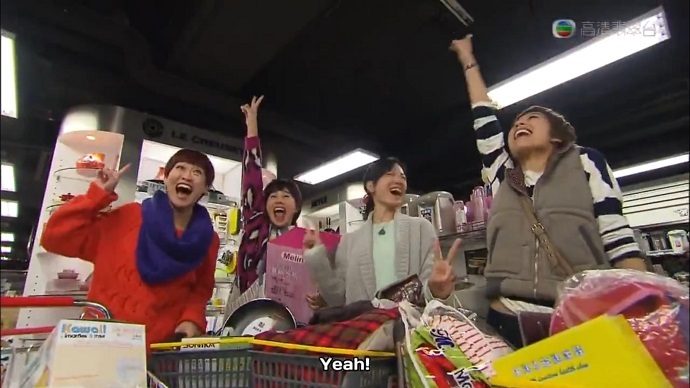 The shopping spree of the first episode is repeated. This time, Apple, Dan Dan, Lin Heung and Fung Nei appear content in the midst of the consumer frenzy. Well, that ending was over the top. This episode was jam packed with slapstick action. The women instigating a food fight with the loan shark thugs guarding them, and the men using teamwork and a football to combat a criminal with a gun were mildly amusing, because they were ludicrous. The more painful parts of this episode were the sentimental reunions of Tai Shu and his mother, then Tai Shu and Apple. With the latter, I did not know if the writers expected me to find Tai Shu equating himself with an apple tree, rapping about being an apple, then Apple joining in, touching. I just found it painfully cheesy. Kudos to Priscilla Wong for managing to maintain her dignity, and look genuinely touched by that ludicrous display. Finally, we ended with the parade of pat happy endings before an approving audience, in a single scene. If I were in the crowd watching these people compliment each other nonstop then announce their good fortune, one after the other, I would wonder whether I had stumbled upon a cult’s gratitude circle. It was just schmaltzy beyond belief. However, I still have questions that the ending failed to answer. What happened to comatose criminal, Wan? Are the women freed from their debt to him thanks to police intervention? Why did Fung Nei’s husband insist on wearing puffy vests, all the time? I suppose Ga Lun’s digestion issues took precedence. I was so embarrassed by Tai Shu’s apple performance that I could barely watch it. So, these screen captures will show me what I scrubbed from my eyes and my memory upon viewing. Thanks for the recaps. I’ve been silently reading since I noticed you had them because I was mildly intrigued after seeing the show on myasiantv, but was too skeptical to press play. Let’s just say I think I enjoyed it more this way. Hey, thanks for reading! If I saved precious hours of your life with my recaps, then it was worth it.